Who doesn't love Snapple???? I know I do and I just found out about this freebie. So, mark your calendars and enjoy! 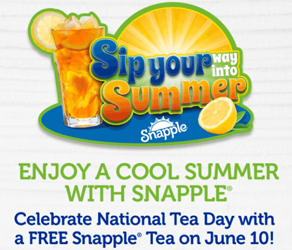 Get a FREE Snapple Drink Coupon on June 10th – Get a coupon for a free 16 oz. Snapple Tea or Juice or 18.5oz. Snapple Straight Up Tea.